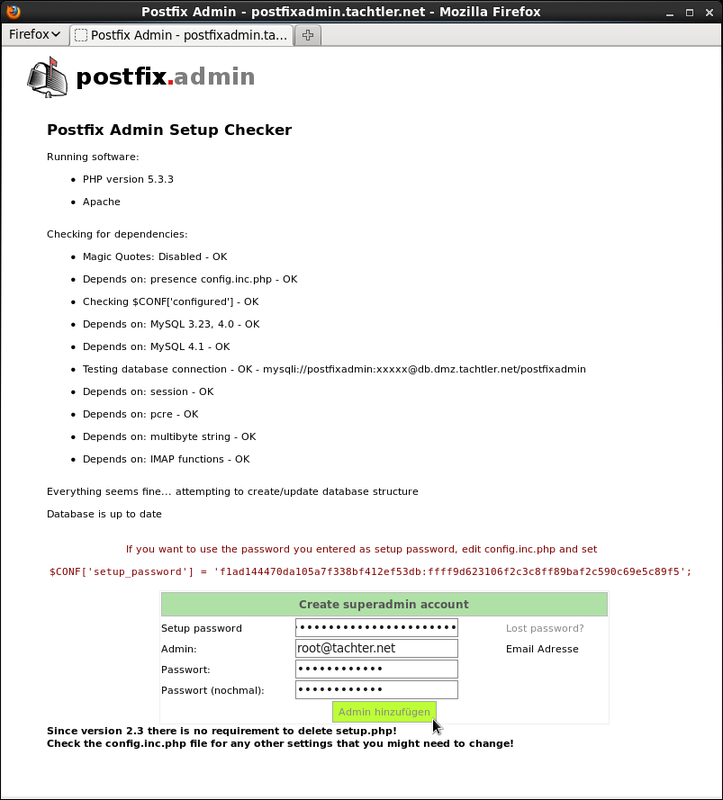 Postfix Admin ist eine Web-Anwendung zu Verwaltung von e-Mail-Konfigurationen wie Postfächer, virtuellen Domänen und Aliase, primär für den Einsatz mit dem MTA Postfix konzipiert. Nachfolgende Konfigurationen sind nach erfolgreicher Installation erforderlich. Damit Postfix Admin genutzt werden kann, muss dieses ein Backend-System zur Datenhaltung haben, welches hier aktuelle ein MySQL-Datenbanksystem sein soll. Um nachfolgende Befehle ausführen zu können, muss eine Anmeldung am MySQL-Datenbanksystem mit einem Benutzer, welcher einen administrativen Zugriff auf die Datenbank hat, erfolgen können. dem Benutzer postfixuser entsprechende Rechte für die Datenbank horde4 erteilen. enthält die vorgefertigte Konfigurationseinstellungen von Postfix Admin. 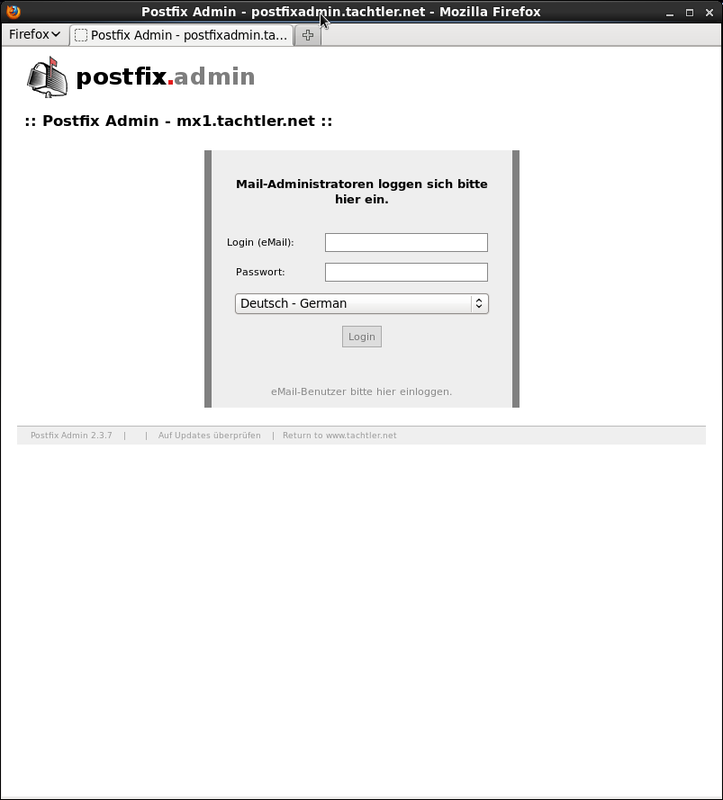 WICHTIG - Bei einem UPDATE von Postfix Admin, werden die persönlichen Konfigurationen, so NICHT überschrieben !!! * @license GNU GPL v2 or later. // Language files are located in './languages', change as required.. Allows to add or override $PALANG interface texts. added to languages/*.lang in future versions of PostfixAdmin. in the 'case "XY":' section). Usually the 'default:' section should contain english text. can benefit from the corrected text/translation. // If you need to specify a different port for a MYSQL database connection, use e.g. // If you wish to connect using a local socket file (e.g /var/run/mysql.sock) uncomment the below. // In what flavor should courier-authlib style passwords be encrypted? // If you use the dovecot encryption method: where is the dovecotpw binary located? // New/changed passwords will be validated using all regular expressions in the array. // error message from $PALANG (see languages/*) will be displayed. // about the regular expression syntax. // If you need custom error messages, you can add them using $CONF['language_hook']. // (separated with a space). // Generate a random password for a mailbox or admin and display it. // If you want to automagically generate passwords set this to 'YES'. // Always show password after adding a mailbox or admin. // If you want to always see what password was set set this to 'YES'. // If you want to define your own function to generate a maildir path set this to the name of the function. you can write a hook function to modify $struct in the *Handler classes. $struct. The list page is not yet updated automatically. to avoid clashes with future versions of PostfixAdmin. See initStruct() in the *Handler class for the default $struct. See pacol() in functions.inc.php for the available flags on each column. // If you want to enforce domain-level quotas set this to 'YES'. // If you want to define additional transport options for a domain set this to 'YES'. // Read the transport file of the Postfix documentation. // If you want to define additional transport options put them in array below. // You should define default transport. It must be in array above. // If you want to use virtual vacation for you mailbox users set this to 'YES'. // real domain (i.e. you don't need to setup DNS for it). // This domain must exclusively be used for vacation. Do NOT use it for "normal" mail addresses. // If you want users to take control of vacation set this to 'YES'. // Set to 'YES' if your domain admins should be able to edit user vacation. // If you want to define additional reply options put them in array below. // Postfix Admin inserts an alias in the alias table for every mailbox it creates. // to work you need to have the mailbox replicated in the alias table. // If you want to take control of these aliases as well set this to 'YES'. // in one 'goto' field in overview, the rest will be hidden and "[and X more...]" will be added. // '0' means no limits. // also requires postfix to do more database queries. 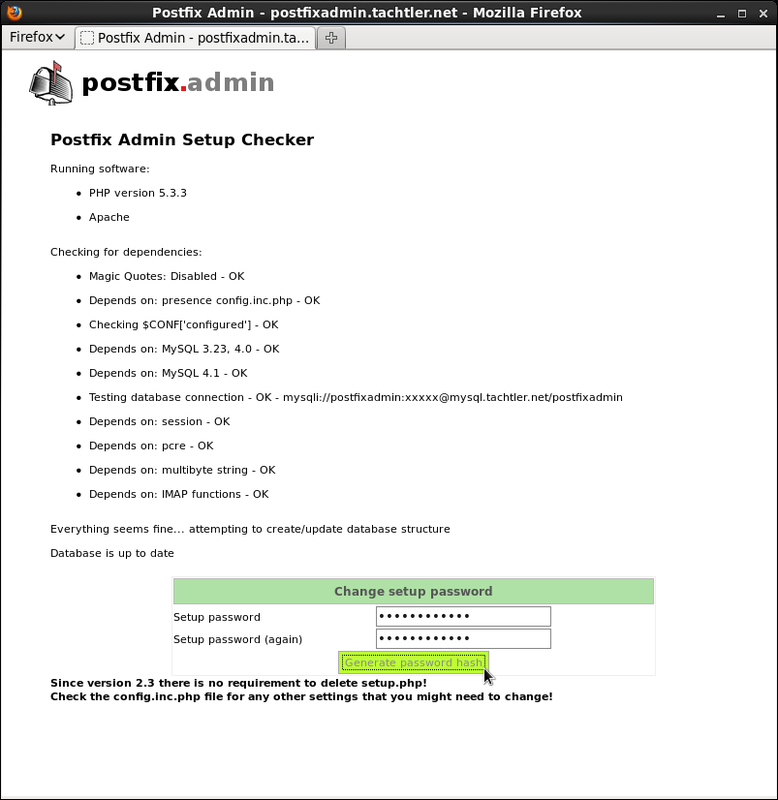 // Note: If you update from 2.2.x or earlier, you will have to update your postfix configuration. // Set to 'NO' to disable alias domains. // This should be set to NO, except if you *really* trust *all* your users. // You can display a MOTD below the menu on all pages. // This message is send to every newly created mailbox. // Change the text between EOM. //          Welcome to your new account. Herzlich Willkommen auf dem Mailserver von tachtler.net! // address is legal by performing a name server look-up. // elsewhere, you will probably want to disable this. // If you use a recipient_delimiter in your postfix config, you can also honor it when aliases are checked. // Set to "" to disable this check. // Script to run after alteration of mailboxes. // Script to run after creation of domains. // Sub-folders which should automatically be created for new users. // The sub-folders will also be subscribed to automatically. // Will only work with IMAP server which implement sub-folders. // Will not work with POP3. // create_mailbox_subdirs_host must also be defined. // Normally, the TCP port number does not have to be specified. // you can add a custom CSS file. It will be included after $CONF['theme_css']. // Tachtler - Can't include config.local.php into config.local.php himself! anzulegen und mit entsprechenden Besitz- und Dateirechten auszustatten, da Postfix Admin ohne dieses Verzeichnis nicht startet. 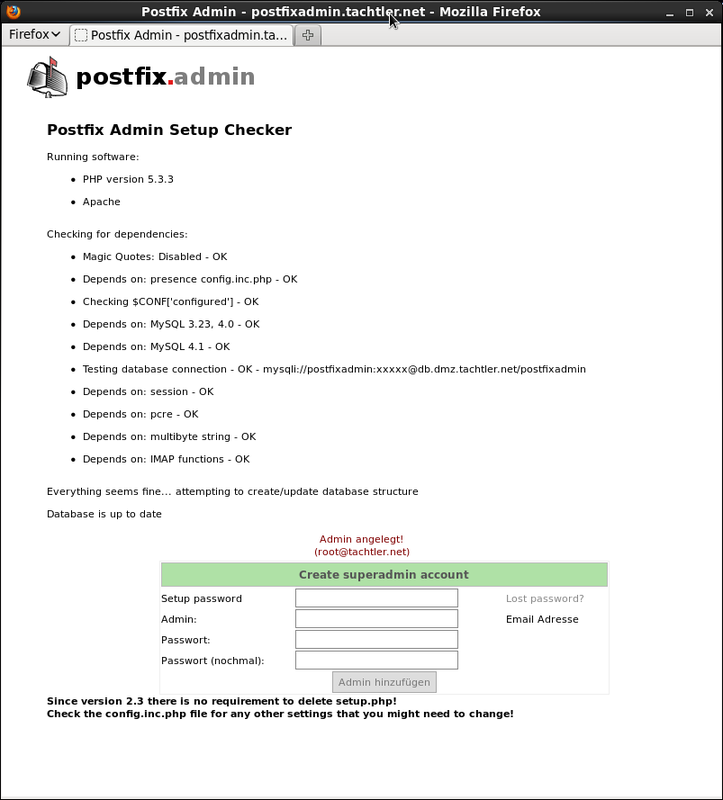 HINWEIS - Bildschirmkopien sind von der Postfix Admin Version 2.3.7 ! und regelt, welches Modul und welches Backend-System für die Authentifizierung am Postfix-Mailserver verwendet werden soll. Eine Überprüfung, ob eine Abfrage gegen die MySQL-Datenbank-Tabellen, beim senden z.B. einer Test e-Mail über einen Weg der SASL-Authentication vorschreibt (z.B. submission) erfolgreich war, kann durch nachfolgende zeitweise Aktivierung jede SQL-Anfrage in das MySQL-Log zu schreiben. Log aller - SQL-Anfragen nach /var/run/mysqld/mysqld.log - aktivieren! HINWEIS - Jetzt sollte die e-Mail eingeliefert werden !!! Anschließend wieder das Log aller - SQL-Anfragen nach /var/run/mysqld/mysqld.log - deaktivieren! liegt dies an Einträgen von ein und der selben Domain in virtual_mailbox_domains und relay_domains. #                       btree:/etc/postfix/relay_domains must be empty! WICHTIG - Die Konfigurationsdatei /etc/postfix/relay_domains muss leer sein, oder darf nur Domains enthalten, die nicht durch Postfix Admin verwaltet werden! HINWEIS - Somit werden alle Domains die durch Postfix Admin verwaltet werden als virtuelle Domains angesehen!